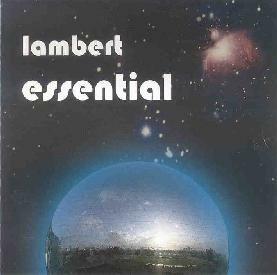 Lambert is the name of a fairly prolific solo synthesizer artist from Germany. He has been releasing material since 1989 and this is a collection of some of his more accessible material as well as some completely unreleased tracks. It was released in the year 2000. The material is extremely well composed but a little too sweet and commercial for my nature. I prefer my synthesizer music out in space. There is plenty of info and sound samples on his record label web site that he runs, also releasing other Berlin school influenced electronic music composers. For more information you can visit the Spheric Music web site at: http://www.sphericmusic.de. Contact via snail mail c/o Spheric Music; Lambert Ringlage; Messings Garten 7; 45147 Essen; Germany.